Many people have commented about how they couldn’t do what we did because they’re so tied to their house and possessions, raising the question. . .
What did we do with all our stuff? Shipping large items in a sea container wasn’t appealing to us, as we weren’t sure how much of our stuff we’d want, plus hated the idea of spending thousands of dollars, then possibly spending thousands again if we moved a year later. With that in mind, we decided to ship only small items which were either light or high-value. When deciding what to store, we recognized that even if Hawaii didn’t work out, we probably weren’t coming back to Virginia, so we only kept items that we’d be willing to pay to ship cross-country. That worked out to fill a 10×20 storage unit 2/3 full. We kept our beds, some patio furniture, some of Kirsten’s favorite furniture pieces, some decorative items, then miscellaneous stuff like hockey equipment and small appliances. The stuff we decided to keep was only about 1/3 of what we had in the house, so it was time to get busy selling! The main way was selling individual items on Craigslist. Anything worth more than $100 was listed on Craigslist. We sold many different items this way. And not just furniture. We sold lamps, bikes, a garage freezer, kids bedding and even curtains. A few other items found their way to ebay as well. 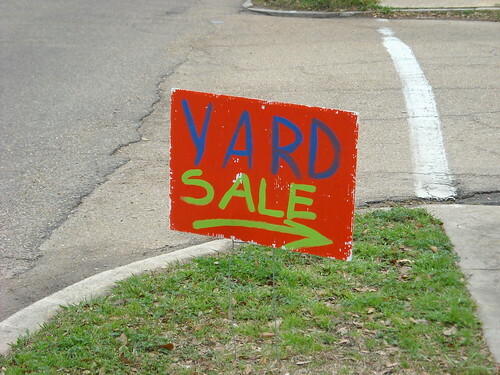 Items worth less than $100 were kept for a yard sale. In retrospect, we should’ve had 2 separate garage sales: the first a few months before we moved to get rid of anything we could live without for a few months and then another one later for the ‘last minute stuff’. As it was, we had one ginormous sale a few weeks before we moved and then had to scramble to list things on Craigslist that didn’t sell or just send them off to Goodwill. One car was sold to my dad, and the other was sold via Craiglist. That was a little weird, but we met the buyer at his bank and saw him get a valid cashiers check and we had a bank employee notarize the required documents. Things that were in good shape but would be hard to sell for much, like clothes, coats, etc., were donated to Goodwill. We had at least 3 separate van loads that we donated at the end and countless other trips those final 6 months. Just about anything left that was salvageable was freecycled. I really wanted to minimize what went into the garbage dump so we freecycled many items throughout. A few times I even skipped this step and had a pile at the end of my driveway with a big “Free” sign on it. Its amazing how fast you can get rid of things this way especially if you post the list of items in the “free” section of Craigslist with your address. On our move-out day, all the miscellaneous stuff left became the property of my dad. I get a chuckle every time he tells me he just opened one of the bottles of red wine he inherited or saying he washed his car with the leftover carwash detergent. It definitely was a process which could’ve been simpler if we weren’t trying to maximize our profit. Regardless, everything got shipped, sold, stored, or donated and we were free to head off on adventure.